One of the earliest spring arrivals from central and South America I look forward to seeing is the diminutive Blue-gray gnatcatcher. It is sometimes described as a “miniature mockingbird” because of its similar plumage and body shape. They can be seen along wooded edges and open wooded areas all across the state. They often begin nest building even before trees are fully leaved. 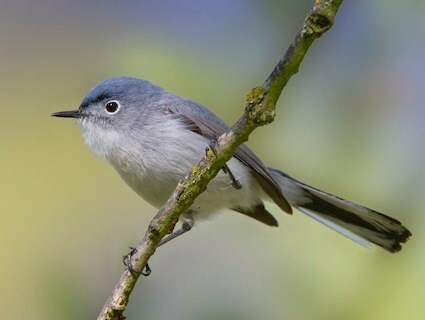 The Blue-gray Gnatcatcher measures about 4 ¼”, blue-gray above, whitish below, with a narrow white eye-ring, and has a long tail mostly white underneath that is often flipped about and cocked. Listen for their call which is a thin zpee, or zpee-zee sound. This little bird never stops moving so be prepared to just catch glimpses as it forages for insects in the trees.